When it comes to weddings, most of the time it's better to just 'go with the flow' than to try to have everything down to a T - or as one wise Galway bride says 'whatever will happen, will happen'. That bride - Nicola Kelly from Kilkerrin in Co. Galway - had her dream day well planned out until her father suggested they forgo the plush car she had hired to bring her to the church in favour of something with a little more 'oomph' - a last minute change has given her memories to last a lifetime. Nicola was originally meant to spend a glorious journey from house to church in the plush surroundings of a vintage white Rolls Royce however, being from a farming background and with the tractor lying idle for the day, her father volunteered to drive her to the church himself in their Massey Ferguson 7620. At the last minute however, he had a change of plan. "He just turned around at the last minute and said to me 'I'm not going to drive it, you'll drive it'," Nicola tells THEVOW.ie. "I said 'I won't' then he said 'Ah you will', and I just thought; for him, I'll do it". As one of three sisters, Nicola is well used to taking the tractor out to till the family's land but this was a totally different feat - one that saw her saying goodbye to her old life as she made the journey by driving herself into her new one. On the way to the church on the 21st July, Nicola's neighbours came out to wave her off into married life, with many along the way hanging out signs of well wishes and 'keeping her lit' with fires along the road. 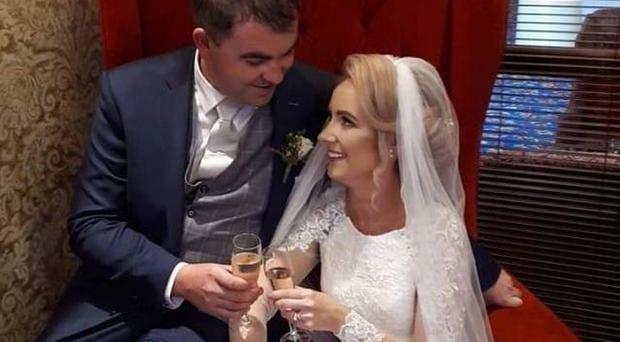 "It's very common in the Galway area where you'd see fires along the way to send the bride off," Nicola explains, "because she more than likely is leaving her own village to go and live with her new husband." The day saw Nicola officially leaving her family home to move to Headfort with husband Aidan Lee. "It was a bit emotional," she says of the tractor ride with her father to the church, "I wasn't expecting to see as many people out and when I got to Kilkerrin Village there were so many people standing outside the pub waiting." "Not many knew I was going by tractor but our videographer told them before I arrived so they all waited outside." Niamh had a quick change of footwear from pink wellies to crisp white heels once she disembarked from the vehicle. She headed in to the church to say 'I do' before the husband and wife emerged and went on to celebrate their nuptials in The Landmark Hotel with 260 guests. Having just tied the knot herself, Nicola advises brides to not let the planning stress them out too much and go with the flow. "Don't panic, whatever is going to happen is going to happen," she says. "Looking back, even on the situation with the tractor I was saying 'no I'm not going to drive it, I'm not going to, I don't want to I'm pure nervous'... But now, looking back, I'm so delighted I did." THEVOW.ie There was very nearly murder on the dancefloor at a wedding in Dublin over the festive season, as eager guests vied to be crowned next in line to say 'I do' by coming out victorious in a bouquet toss.